The phrase ‘a picture paints a thousand words’ is a bit overused and it is most often used in marketing to depict the need for adding good images for selling some product or service. The most appropriate way is to sell something by providing it with the chance of selling itself. If there is an image that’s well constructed and if it shows the product in its best form, this can boost its sales much more than any cleverly-written description. This is one among the well-kept secrets in the world of web designing and this is probably why the e-commerce sites are loaded with images. With the advancements of the internet, images have started improving the user experience and hence they are now considered as a pivotal part of web designing. Designers are using tools for editing in the Lightroom to retouch their photos and make them perfect before adding them to a website. Read on to know the significance of images in web designing. We can’t deny the fact that more than half of the population can process data and other details easier when they’re presented in the form of an image. Pictures tend to be easier to the eye as they break down heavy chunks of information and thereby help in creating a better experience for a person who’s scanning the page. In case of kinesthetic and auditory learners, there’s enough evidence which shows that they notice images sooner than text. This clearly means that regardless of your learning type, you will still think it’s easier to browse through a page that contains images. As per the age-old adage, a picture can speak a thousand words but at the same time, it can even evoke different emotions. If you are designing a website for some popular law firm whose location is the most vital part of this work, using photographs of quiet beaches, twinkling harbors, and rolling hills will evoke feelings of tranquility and ease. This also depicts the web users that this law firm is proud of their locations and this is something that is better portrayed in images. This state implies 2 things about the vitality of images in web designing. Firstly, it is a clear implication of the fact that people love images. Since Facebook is the most famous social media platform, it can be well assumed that a stat that’s related to Facebook can well be applied to the rest of the websites as well. Secondly, it also proves that images promote the best kind of response. Whether it’s a comment or simply a ‘like’ or sharing with friends, images evoke more response than texts. So, adding images will boost your visitors to stay longer on your website. What does it take to make a great image? Professional: No, don’t use your iPhone pictures. Use professional images and make sure you also retouch the pictures with the different Lightroom presets that you get in WordPress. Compelling: In case you’re using stock images, ensure they’re of good quality and the photographs have a professional look. Choose stock images wisely. Relevant: Using pictures of your office, your products and your venue will gain better relevancy than stock images. Unique: Don’t use images that are common. There are many choices and be strict about your choice. 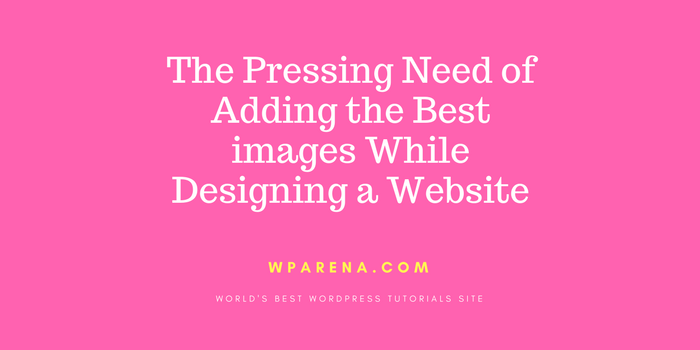 Therefore, now that you appreciate the importance of images in web designing, make sure you search at the right places for the best images for your website.